Amplify your voice, music, and audio content with influencers to reach fans around the world, eager to listen, download, and purchase. The power of radio hasn't changed. But the way we listen to it has. Streaming services have changed the way music and audio content is being discovered, listened to, and purchased. Today, almost all digital audio content is now promoted, discovered, and listened to online through social media, mobile apps and other streaming services. The level of impact your digital presence has on your potential to be successful cannot be understated. As an artist, it is critical to make yourself discoverable on every platform or social channel possible. That’s why we’ve created a special way for music publishers and audio content creators to reach more fans through social influencers. Whether you are promoting a podcast, audio book, song, album or playlist, Snips Social Beats is the most powerful way to amplify your voice and get your audio content heard by fans everywhere. Music lovers can easily sample tracks, podcast listeners can quickly find their newest talk, and readers can discover new audio books. These days, there is a lot of noise on social media. To break through the sound barrier and reach consumers, publishers need a seamless way of promoting their audio content to fans ready to listen, download, and share. A simple, unified framework for sharing audio samples on demand is certainly one way of standing out. But driving action is even more important these days for artists. The focus has to be on value and performance, ensuring the sponsor of the content only pays for engagements, not just visibility. When that happens, tunes can be shared broadly, and influencers with loyal followings can play a pivotal role in changing the way music is discovered and consumed. After all, like traditional content, the art of sharing audio over digital channels can mean huge reach, exponential downloads, greater sales, and more. Snips Social Beats is the first automated marketplace that connects artists and influencers at scale with the simple purpose of sharing awesome music and audio content. We've adapted the concept of sponsored posts to a performance-based advertisement platform that runs natively across social networks, blogs, websites, emails and messaging. The social posts may also include an audio sample inline. Now, influencers can help musicians, podcasters, authors, spokespersons, or truly any content creator easily promote their shareable audio content organically. The result: significantly higher audience engagement and plays. To maintain accountability, Social Beats operates on a performance-based cost-per-acquisition (CPA) model. That simply means advertisers only pay for real measurable results, while influencers earn by driving music purchases, streaming subscriptions, or podcast downloads. We empower publishers and influencers alike through transparency, access to a suite of tools to track campaign performance, and the power to choose what to share and where to share it. No other music promotion platform provides the automation, flexibility, and scalability of Snips Social Beats. 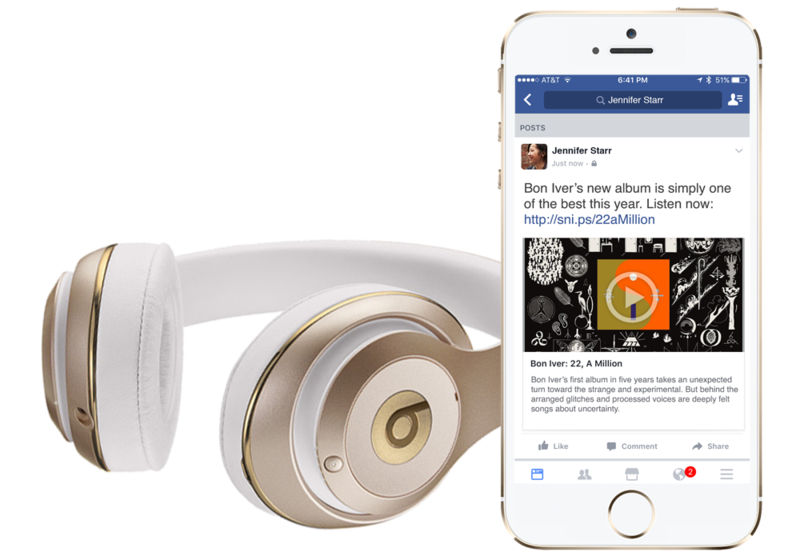 Social Beats campaigns allow influencers to promote any audio content across any social media or online platform. Influencers snip and share the link to the Social Beats campaign, adding their own message or voice to the post. When followers click on the snipped link, they are taken directly to the content page. What content can I promote with Social Beats campaigns? You can promote music artists, songs, albums, concerts, playlists, audio books, podcast, and other audio content. Can I include an audio clip? Through Snips, you can generate an audio clip of :15, :30, or :60 secs from an uploaded MP3 file. Snips converts your audio clip and album artwork into a MP4 video file. Most social media and digital platforms will automatically embed the video in shared posts, so audiences can play and listen inline. How is Social Beats different than native social media ads? Social Beats is a universal advertising platform for promoting audio content across any social media, like Facebook, Twitter, LinkedIn, or Pinterest. It appears as native content in your profile, with the addition of your own voice added to the post. While most social media advertisements operate on an impression model with no garauntee of engagements, Social Beats operates entirely on a performance-based cost-per-acquisition (CPA) model, so you only pay for real results. What types of conversions are acceptable for a Social Beats campaign? Examples of acceptible conversions for Social Beats campaigns include music or ticket sales, signups, and subscriptions. Can I choose Influencers for my Social Stories campaign? You cannot select individual influencers for your campaign. However, you may target preferred influencers by category, geo-location, and age range, which helps in promoting your campaigns to the right groups of influencers.